The 11th edition of In-outlet guide is confirmed as a reference point for quality shopping and tourism. The guide to the best outlets offers useful tips and information on best reality in our region and is free distributed at all tourist offices, accommodations and in the best outlets Le Marche, or attached to the n. of June of Panorama Travel, available in some Italian regions. This edition welcomes major fashion brands such as Janet & Janet Valentino Orlandi, Combo, Momino and Manas, and in the Food and Wine, the Delicacies section, Boccadigabbia, Moncaro and Fazi Battaglia. Among the brands that reconfirm their presence: Loriblu, Rossi, Massimo Rebecchi, Début, Safari Walk, Andrea Morelli, Tombolini, Vic Matiè, Simonetta, Rodrigo, Giorgio Grati, Le Rosse 41, Malagrida … and many others. The official website http://www.in-outlet.it/en/index.asp will propose soon a revolution: new graphic, new features, new contents, greater interactivity with users, in addition to outlet pages, maps, opening times and other information. You can download for free the In-outlet Card, through which you’ll have attractive discounts and benefits in affiliated shops. 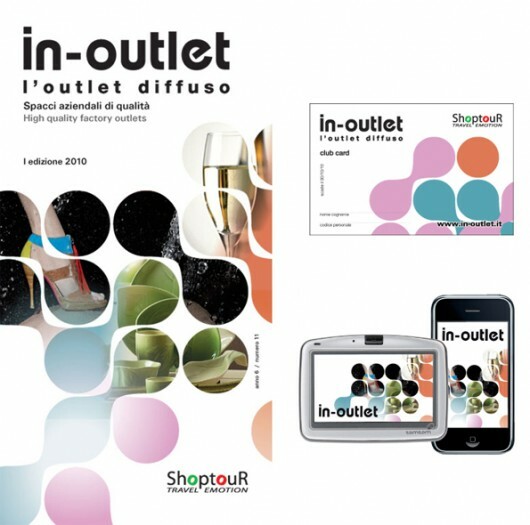 In-outlet also offers the novelty of 2010 … we are the 1st in Italy to have developed a unique and compatible application for I-Phone and Smart Phones: an interactive guide and a browser on your mobile phone! The application is also for all satellite navigators TomTom, Garmin and Pocket PC, a free software that offer the best routes to your favourite outlets. Find out the In-outlet world… and surf with us to a quality shopping .